long pepper, originally uploaded by plainliving. While browsing the many exotic spices at Capers I stumbled upon long pepper for the first time. Of course, when I came back to purchase it, there was non to be found. So I was thrilled (and relieved) when I discovered more of it at Southern Seas Trading Co (in Granville Island Public Market). If you’ve never smelled long pepper, you’re probably puzzled why I was so excited to find it. Especially when I had absolutely no idea how it tastes like, not to mention how to put it into use. It is musky, sweet and just so warm and cuddly it makes you want to sigh a long Ahhh. Knowing that there is such a smell in the world is good enough to me. And being able to use it in cooking and baking is like delving into an unknown adventure. Long pepper is indeed related to black pepper. 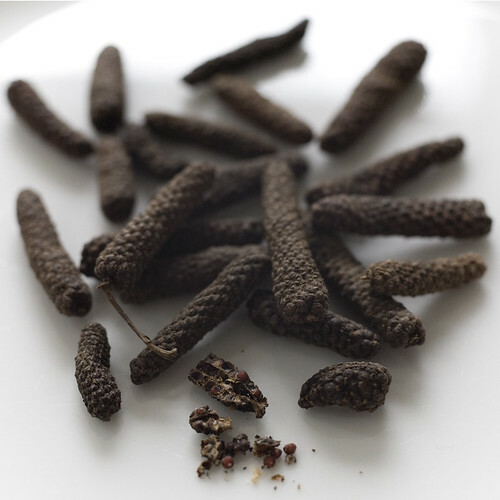 And way back when Europe began its introduction into exotic spices from India, long pepper was prized more than most any other spice. That was until black pepper was discovered as well – it is not only much more affordable, but also easier to grind and work with. Long pepper is very hard and difficult to grind or grate. So far I have only been using it whole, and am yet to figure out the best way of grinding this beautiful and unusual spice, which really is just a miniature cluster of peppery seeds (if you’ve ever seen fresh peppercorns still in their cluster, you’ll know what I mean). But I’m most excited about using it for its scent along: throw a couple of long peppers into sachets and potpourri blends, or just on their own in drawers of stationary or even lingerie. I’m also going to try to tincture it and use it in my perfumes, tough I’m fully aware that using it this way may not be as effective as I’d like. But you can’t know till you try.